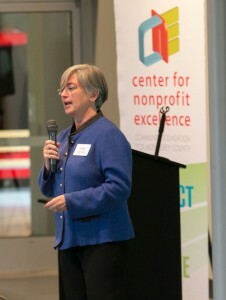 The Center for Nonprofit Excellence and other members of the Capacity Builders Network have been meeting quarterly for the past two years to coordinate efforts to boost the effectiveness of local nonprofits. For the first time, the Capacity Builders Network chose a shared learning theme. Evaluation will be an area of concentration across the organizations for 2015. The hope is that by offering complementary trainings, nonprofit organizations will gain a deeper understanding of ways to improve their programming and community support. Capacity Builder Network Members: Action Council, Association of Fundraising Professionals (AFP), Community Foundation Santa Cruz County, CSUMB, Development Executives Network (DEN), First 5 Monterey County, Hayashi Wayland, Leadership Monterey Peninsula, Nonprofit Alliance of Monterey County (NAMC), Salinas Public Library, Seaside Public Library, TPO Human Resources, United Way’s Volunteer Center, and Foundation for Monterey County Free Libraries.